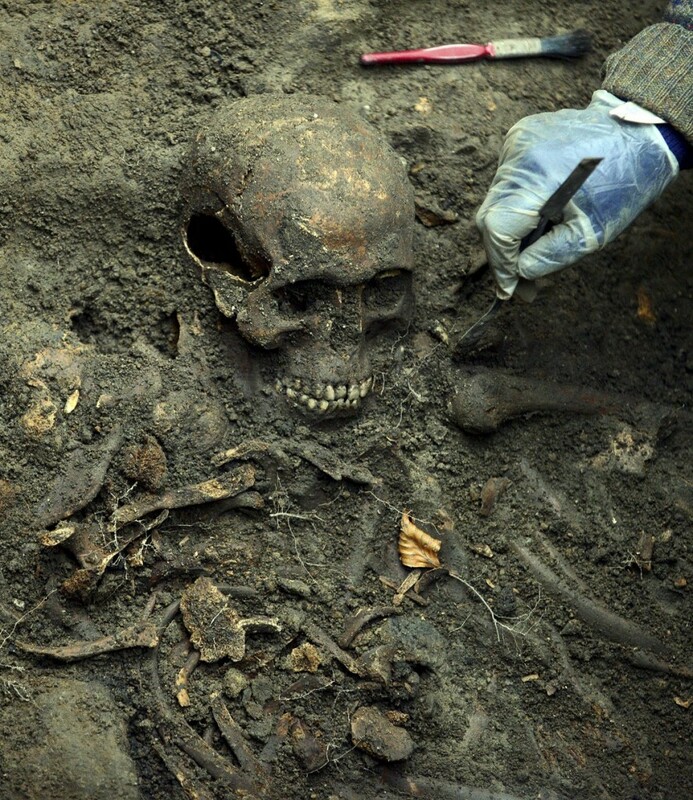 Further tests are to be carried out on skeletons recovered from a centuries-old mass grave in Durham City. Initial analysis on the bones of 28 individuals recovered from the site provided some evidence as to their origins and identity but was inconclusive. The tests, coordinated and partly carried out by Durham University’s Department of Archaeology, included examination of the human bones by academic specialists; radiocarbon dating of two individuals and a programme of isotope analysis to ascertain diet. The University is to commission radiocarbon dating of some of the other skeletons, with results expected in the New Year. Preliminary results show that all of the 28 individuals were male and aged between 13 and over 46. About half were under 20 years of age. No evidence of blunt force or trauma was found on the bones. The remains of two individuals have been radiocarbon dated and the results point to a date of death sometime within 1440-1630. Some individuals show evidence of having smoked clay pipes. Tobacco was only introduced into England in the 1570s and became popular by the end of the 16th Century, so this helps to narrow the date range further, perhaps as tightly as 1610-30. The isotopes from the bones of two individuals show that marine resources, such as fish and shellfish, did not form a significant part of their diet, suggesting that they did not live by the coast. Mr Richard Annis, Senior Archaeologist, Archaeological Services Durham University, said: “A possible association has been suggested between these remains and the Scots prisoners who died in Durham Cathedral and Castle following the battle of Dunbar in September 1650. “The radiocarbon dates obtained so far are incompatible with this hypothesis. “However, in view of the exceptional interest in the burial and the small number of samples so far analysed, the University has now commissioned radiocarbon dating of further individuals. The Battle of Dunbar took place during the Civil War in 1650 when the English defeated a newly recruited and unprepared Scottish Army. Captured prisoners were marched south with significant numbers ending up imprisoned in Durham Cathedral and Durham Castle. At this time and throughout the Commonwealth, Durham Cathedral was empty and abandoned, its Dean and Chapter dissolved and its worship suppressed by order of Oliver Cromwell. During the hard winter of 1650-51, many of those incarcerated at Durham died of malnutrition, disease and cold.